Marine cephalopods such as octopuses, squid and cuttlefish are unusual animals for a number of reasons -- they move around using jet-propulsion, they have a high degree of intelligence (far more than other invertebrates)... and they defend themselves from predators by deploying a cloaking screen of dark-coloured ink. In the past, people used to extract this ink and use it for drawing or writing ("sepia" is the Greek word for cuttlefish). The extinct cephalopods known as belemnites, which flourished during the Jurassic period, produced ink in exactly the same way... and fossilized belemnites are sometimes found with their ink sacs still intact. Some of the early Victorian fossil hunters discovered that this Jurassic ink could be ground up, rehydrated and used perfectly well to draw or write with... for example, in Lyme Regis Mary Anning and Elizabeth Philpot used fossil ink to illustrate some of their newly discovered ichthyosaur specimens. 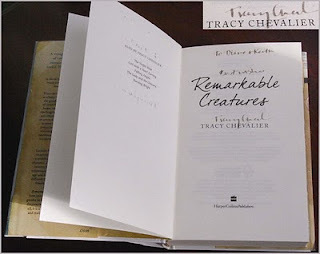 The book pictured on the left is Tracy Chevalier's Remarkable Creatures , which is a fictionalized biography of Mary Anning and Elizabeth Philpot... and just happens to be signed by the author using ink extracted from fossils of the early Jurassic period, almost 200 million years ago! This is one of several copies of the book from a signing event organized by Lyme Regis Museum to mark the book's launch in 2009. The ink used was collected by the museum's geologist, Paddy Howe, from the local rock strata... the same strata explored by Anning and Philpot two centuries earlier. This particular copy of the book belongs to Diane and Keith Shaw, who helped out at the signing event -- my thanks to them for taking the photograph and allowing me to use it on this blog. A short but well-produced video featuring Tracy Chevalier and Paddy Howe can be viewed on the Lyme Regis Museum's YouTube channel.